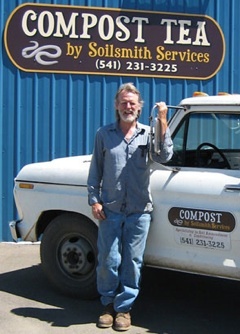 Shepard Smith is the owner of Soilsmith Services out of Philomath, Oregon. He produces and sells high quality thermal compost, vermicompost, and compost tea. His services also include compost tea application and consultation on improving soil fertility. Mud City Press went to Philomath in June of 2010 to talk to Shepard about his products and his business. The interview took place in an open lot where Shepard makes his compost. Several long windrows of dark, almost black compost stretched across the wide open space where we spoke. Mud City Press: Shepard, you specialize in thermal compost and compost tea. Most of us know about compost, but are there qualitative differences between one compost and another? Shepard Smith: Yes. I think we've all had our hand in composting kitchen waste or clippings from the yard and we just think that you throw it all in one spot and something good is going to happen, but more often than not it just sits there and sits there and attracts vermin or something not desired. In the end, the composting process is an art. It's about understanding the dynamics of decomposition and the only way to do that is to get your hands in it. Like farming, making compost is different every year because the weather is part of it. 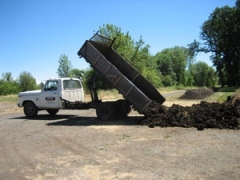 Some companies providing various landscaping materials will call something compost that's actually a mixture of four, five, or six materials. Others don't manage for temperature and moisture–and that's critical. Of course, turning it is as much a catalyst for the process of decomposition as is the nitrogen that you might mix in with it. So with proper air, water, and temperature management, I can produce a quality compost in about twelve weeks. If I just let it sit without turning, it might take two years. So there's a real process that you need to be cognizant of. MCP: What do you use to make your compost? Smith: Surrounding communities have a public leaf collection service in the fall which also makes those leaves available to people, like myself, who can use them. I have them delivered directly to my compost facility. During the year, several other materials may become available and I take advantage of those opportunities. I use "broiler" litter which I get from an operation in Mollala that raises chickens for meat. And because of the shortage of sawdust, rice hulls are substituted as bedding, bringing into the mix, a rich source of silica. MCP: As said before most of us are familiar with compost, but compost tea is just getting to be known. What is compost tea and how is it made? MCP: What does the compost tea offer that other types of soil amendments don't? Smith: It's biologically alive, and that's the central point of my compost and compost tea business–to help farmers introduce the living component into their soil management practices. We've been so dependent on chemistry and chemical additives that we've forgotten that the heart of the soil is its biology. There are activities that go on between bacteria, fungi, protozoa, and nematodes that are highly productive and that make minerals and other by-products available to the soil as an ongoing process. The soil is literally alive and enriching itself all the time. It's time to regroup and look at the biology and how we can best manage that. That's what I concentrate on. MCP: What makes compost tea unique? Smith: What makes the compost tea unique is really the quality and living composition of the compost it's made from. So when I'm trying to introduce compost tea to a farmer, I want to be assured that I have a good source of high quality compost from which to make that tea. For that reason, I have my compost tested so that I have an idea of what the microbial composite is–bacteria, fungi, protozoa and so forth. MCP: Is there any scale limit to using compost tea? Smith: Not really, if managed properly, and you have Mother Nature helping a little. I have recently met people with large acreage, 1000 acres or more, who use compost tea, but on a trial basis. I don't have the means to create that much tea, so it's important to share the knowledge, perhaps show others how they can do it themselves. But generally, I target smaller operations. I really cater to the residential public, community parks and recreation areas, backyard gardens, nurseries and small farms. Especially in the last couple of years, I have seen a surge in backyard gardening and interest in both compost and compost tea. I have many clients who ordered the minimum 3 yards of compost, delivered, for their raised beds this year. 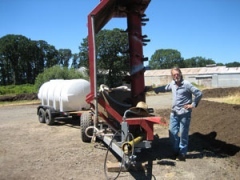 MCP: You have worked with many farmers in the Willamette Valley selling and applying compost tea. How does your relationship with a client start? Smith: When I first begin speaking with a client, I share with him my experiences on other farms here in Oregon, just to give him an idea what he might expect. Then we talk about what crops he has and his rotations and what soil test data he might have. This helps me get a better idea what he needs and what approach I will use. Often the soil data is not available or it's outdated, so I may do some soil samples myself and send it to a local lab that I'm familiar with. It's really good to have some tests as a base of information to draw upon if you do consider a compost tea program. MCP: When you're working with a farmer, do you just go in and apply it one time in the beginning of the year or is there a seasonal program that you have? Smith: A fall application is generally the first application of an annual program. It is also generally the best time to apply, especially here in the moderate climate of the Willamette Valley. The spring is also another time when we could possibly do a ground application, although I have found that ninety percent of the time it's just too wet to get heavy equipment in the field early enough to do this. There again, the fall application becomes the most important because you can get into those fields before it gets too wet–though you want to get in the fields when there is some moisture, so we're talking early to mid fall. MCP: Tell us a little about actually applying the compost tea to a field. Say you have a ten-acre plot, what application method do you use? Smith: I have a 200-gallon skid sprayer with 300 feet of hose on a reel. With this, I can do small orchards, small vineyards, berry farms, and other small acreage situations. For pasture and small orchard applications, I have another unit that fits onto the receiver hitch on the back of my truck. It's a boom-less sprayer so I don't have to worry about running over anything. I can just drive in and apply the tea. MCP: At what rate do you apply the tea? Smith: Generally at about 15 gallons per acre, but that varies with specific concerns that may come up after we've seen the soil tests. MCP: What about during the growing season. Is there any application of compost tea directly to the plants? Can this help with diseases or pests? Smith: Foliar feeding can bring excellent results when applied in a timely fashion, that is, according to developmental periods of the plant. Four applications before harvest would be optimal, but two could be adequate–with one in early spring. What I have observed in my experience growing and my clients' experiences is that foliar feeding really gives a new sense of vigor to the plant, and as many or us know, when a plant is healthy and has everything it needs to grow throughout the season, it is less susceptible to diseases or insect pests. For instance, one product I use is sea kelp. This is a cold water liquid kelp formulation and I mix it with compost tea just prior to application. Spring 2010, many folks in my area suffered rust on their garlic and a lot of wheat farmers in the valley struggled with stripe rust. My garlic was unscathed by rust or white mold, and my client's red wheat down the road had one application of compost tea, fish, and kelp in early May. There is now hope for a decent harvest, but the farmer suggests the chief cause of weakness was the late planting and early cold snap in December 2009. Generally, however, using biological materials, one must have a proactive program aimed at improving the soil. Foliar compost tea application after a problem has started is strictly an uphill battle with no guarantees. MCP: You talked about the compost tea as being alive and containing microorganisms and protozoa and nematodes. What kind of shelf-life does compost tea have? That is, once you've brewed it, how long does it remain alive? Smith: I always brew for an order–that is, I make a new batch. But there are some biological products that the industry has created that are stabilized by lowering the Ph to increase its longevity. I don't do that. I make a fresh product. And I might keep it aerated two or three days, maybe even five days depending on the situation. If the grower has had disease concerns, I will hold that tea a little longer. It seems that the longer you hold the tea and continue to aerate it, like I do, then there's an added measure of disease resistance. A term has surfaced in recent years, "acquired systemic resistance," a term to describe the plants ability to create defenses when conditions may become favorable to disease or insect incidence. A greater focus on the biological component can help establishing this condition. MCP: How does compost tea compare in cost–say if you used it as a substitute for a petrochemical fertilizer? Smith: Compost tea is a single tool. Not a substitute per se. Used correctly, it can overcome some item or items lacking in the soil. It's very comparable to chemical fertilizer and maybe even less costly–somewhere around $15-17 per acre for the tea alone–again, depending on the situation. However, if we're trying to be proactive about the weather and there are concerns about its negative effects in the field, like the stripe rust that we've had this spring, we have to think ahead and apply it in a timely fashion, perhaps twice –which, of course adds to the price. MCP: Shepard, you've been involved in the Southern Willamette Valley Bean and Grain Project since the beginning. How can compost tea help with the transition from grass seed production to food crops? Smith: Most of the farms that are involved in the Bean and Grain Project are conventional farms that are transitioning their acreage–not necessarily to organic or to biodynamics or anything like that, but transitioning towards fewer chemical inputs and improved rotation practices with food crops integrated with grass seed for instance. Though farmers are very familiar with cover crops and rotations, cover cropping is probably the most economical and efficient way of improving the soil. Because we've had so much emphasis on the chemical and synthetic inputs, we've missed the fact that the chemistry is not truly supporting the soil–it's only supporting the plant. What I'm trying to offer is a look at working with the soil and the plants in a different manner–that is, by improving the biology in a field with say, annual or perennial cover cropping, compost, and compost tea and letting the organisms in those products enrich the soil. And they will – 24/7/365. I believe this is one important way to help in the transition. MCP: Some of the farmers working with the Bean and Grain Project are converting from conventional growing to organic. Can compost tea help in the transition of land used for conventional crops to organic? Smith: I believe so. It's my experience that compost tea made from a high quality compost can supplant the "lacking" of the soil to deliver what the plant needs organically until management of the soil reaches a high level of fertility. The tea combined with other biologicals for more specific issues should certainly help during the period of transition. A farmer usually knows that certain conditions could arise before they happen. This is especially true in the case where conventionally managed soils have undergone various forms of depletion, either mineral or biological. So with compost tea the plant can get what it needs through foliar applications. But not just one! It needs to be timed–and the timing is not always convenient–and sometimes frequent–every two or three weeks. The fall soil application has proven year in and year out to be the most useful application for the following growing season. That was especially true in 2010, as it was generally too wet to apply in the spring unless you had better drained soils. MCP: What about the time of transition? Can compost tea speed up the transition to organic? Smith: Every farm is site specific – in many ways. Improvements can easily be recognized within two years, usually. MCP: The last three years have shown that some of the beans we want to grow have been right on the edge for successful cultivation in this region. There's been some success and some failure. Can compost tea help with some of those fringe crops? Smith: I think our practices have generally been to over-fertilize. This tends to make things vegetate in the field longer before they set fruit or seed or what have you. My approach is more of a minimalist approach where you give a plant what it needs, but more importantly when it needs it during the development period of the plant itself. Like perhaps we apply compost tea after a certain number of leaves have been produced or just after the fruit has set. These are critical times in the life of a plant and good times to give the plant a boost. So though we are still learning, I think we might be able to expedite the seed to harvest interval to where, perhaps, we can increase the number of bean varieties we can grow in the valley. I've been here twelve years and the weather's never been the same, so we'll always have to contend with that. It may be that there are pockets in the valley that have greater heat units, like Junction City, where maybe we should focus the specific bean crops so they actually mature and have the time to dry down – because that's been the issue around here. We just need more practice at this and I think we're moving in the right direction. MCP: Thank you, Shepard, for taking the time to talk with Mud City Press. Is there anything else you might like to add? Smith: My mission in life has been to reintroduce methods to rebuild the biological system. When we look at the forest around us, we wonder how in the world did that tree stand become so green and healthy. Well, it's got an undisturbed complex, so I'd like to see that mirrored as much as possible in the field – that is, create the least disturbance to the natural system. That way, we're going to have all the critters, all the microorganisms, all of everything it takes to make a plant develop. So, bringing biology back into our farming regimen has been my mission for 25, 30 years now. The Mud City Press interview with Shepard Smith of Soilsmith Services, "Rebuilding the Life of the Soil," is republished here with permission from Dan Armstrong and Mud City Press.